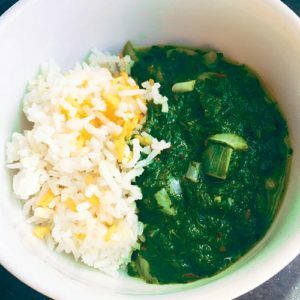 This is based on the saag paneer recipe from Heidi Swanson’s “Near & Far Recipes Inspired by Home and Travel”, with some liberal changes. 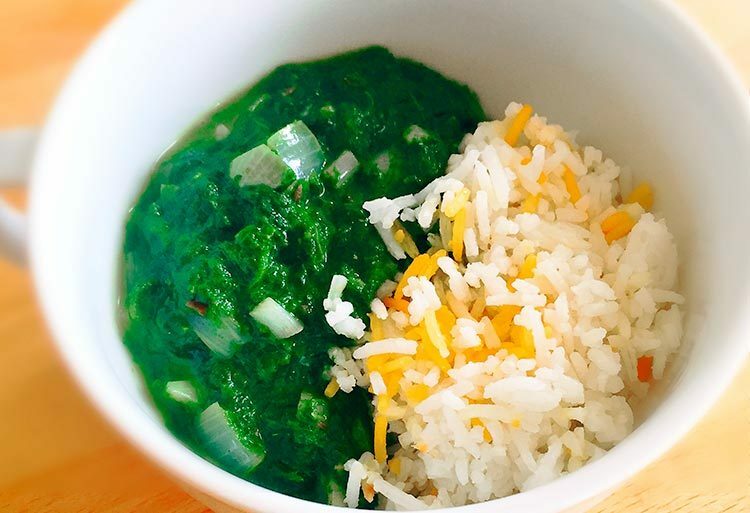 It’s an Indian dish; saag means spinach and paneer is a fresh Indian cheese that is absolutely delicious. Think halloumi but not as salty, and it reheats better as well (in the unlikely event that you will have leftovers). Confession: I used leftover rice from Indian take out that I had the night before. Second confession: I forgot to take a picture with the paneer… so that’s why it’s missing in the photo. Chop the paneer into small squares and sauté in coconut oil in a separate pan. Whenever it is fully browned and crispy and delicious, just turn it off and leave it there. Put the oil in a large pot over medium high heat. When hot, add 1 tablespoon oil and the spinach, stirring until it wilts. Do this as quickly as possible you don't want to overcook the spinach or it will lose it's color. Once wilted, remove from the heat and puree with a hand blender. Pour into a bowl and set aside. Rinse out your pan and put it back on medium high heat with the rest of the coconut oil. Add the cumin seeds, salt, chili flakes, garlic and onions. Cook a few minutes, and then stir in the garam masala. Lower the heat and stir in the spinach. Gradually stir in the buttermilk and keep at a simmer. When ready to serve, lay on a bed of rice and squeeze fresh lemon juice liberally over every bowl. Top with pieces of paneer.